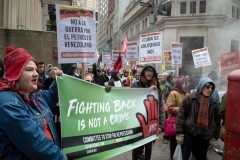 New Yorkers march on Wall Street to oppose U.S war on Venezuela | Fight Back! 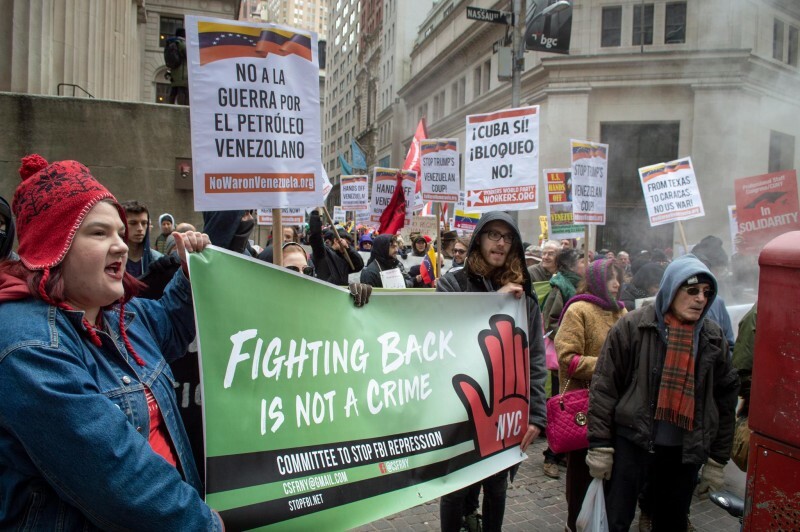 New York, NY - On February 23, approximately 300 New Yorkers took Wall Street in the Financial District to protest attempts at a U.S.-led coup against the popular and democratically-elected Venezuelan president, Nicolas Maduro. Several of the groups involved had representatives give speeches about the current state of Venezuela, how the U.S. has plans to bring in arms, and the importance of our role protesting here in New York. Other organizations connected the ongoing attacks on Venezuela to other countries. The speaker from New York Boricua Resistance commented how the U.S. should not use Puerto Rico as a pawn to invade Venezuela, while a representative from Bayan USA demanded the end to the U.S. war machine from Venezuela to the Philippines. Once the speakers were done, the march began towards Zuccotti Park - famous for being the park used during Occupy Wall Street. Despite the NYPD attempting to derail the march, the protesters made it to the park and had a round of chants and a few mic checks. They continued to the atrium of the World Trade Center. Voices rang out loud and clear demanding an end to U.S. involvement in Venezuela, as onlookers took pictures and stopped their daily routines.